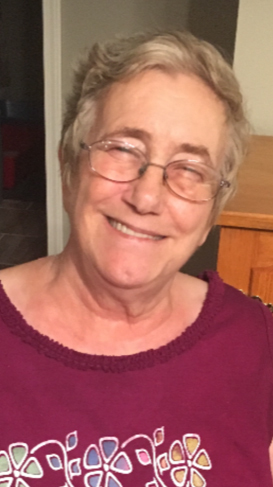 Veronica “Ronnie” Shaffer, age 65, of Belle passed away on Sunday, April 22, 2018 at her residence. Ronnie was born on October 31, 1952, in Peoria, IL, the daughter to the late Herman and Mary (Nabor) Laird. Ronnie had been an area resident for over 22 years and a homemaker. On April 30, 2001 Ronnie was united in marriage to Mark Shaffer in Vienna. Mark survives of their home near Belle. Ronnie enjoyed reading books, putting together jig saw puzzles, making dream catchers, and crocheting. She liked watching sci-fi shows as well as the History Channel. Ronnie loved documentaries and tried to learn something new every day. She also loved animals and was somewhat of “animal whisperer” as even wild animals would simply come to her. She once had a wolf follow her home and stay with her for a few days. Ronnie loved flowers and children but none more than her own grandchildren and great-grandchildren. She will be missed greatly by her family and friends. In addition to her husband of almost 18 years, Ronnie is survived by: four children, Nick Williams and his wife Shelley of Farmington, Gwendolyn Hawk and her fiancé Lance Hughey of Jefferson City, Jessica Rowe and her husband Keith of Ozark, and Billie Jo Bourey of La Salle, IL; ten brothers and sisters, Floyd Collins of Owensville, Kenneth Collins of St. Charles, Daniel Collins of Owensville, Michael Collins of Owensville, Keith Collins of Owensville, Gary Collins of Illinois, Timothy Collins of Troy, Byron Tart of Troy, Velma Collins of Owensville, and Shirley Otto of Titusville, FL; eleven grandchildren, Dominique, Gregory, Sarah, Katie, Courtney, Kayla, Michael, Aiden, Stacia, Brandon, and Kevin; three great-grandchildren, Connor, Teeghan, and Jordynn as well as many extended family members and friends. In addition to her Parents, Ronnie is preceded in death by three sons, Gregory Giger, Joshua Hawk, and Randy Hawk; and infant siblings, Sandra, Victoria, and Benny. Visitation will be held on Wednesday, April 25, 2018 from 5:00 p.m. until 7:00 p.m. at Sassmann’s Chapel in Belle. A casual Memorial Service will follow at 7:00 p.m. Expressions of sympathy may be made to Hospice Compassus.